Recently, an Italian researcher queried us regarding a “votive stone axe head,” of a 3rd century B.C.E. vintage, that he'd been informed was in the collection of Pala International’s Bill Larson. Intrigued, we asked Bill about it. Indeed, he gave us color images of the axe head, fashioned from agate, as well as journal articles and book passages that discuss its enigmatic feature—a cuneiform inscription. We’re pleased to share them with our readers. by George Frederick Kunz, 1913. Included in the chapter Religious Uses of Precious Stones, Pagan, Hebrew, and Christian. 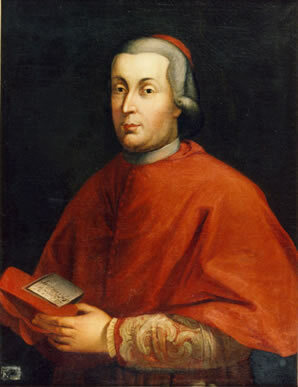 Cardinal Stefano Borgia, who originally came into possession of the axe head. One of the rarest and most significant specimens illustrating the use of valuable stones for religious ceremonial purposes in the pagan world is in the Morgan-Tiffany collection. 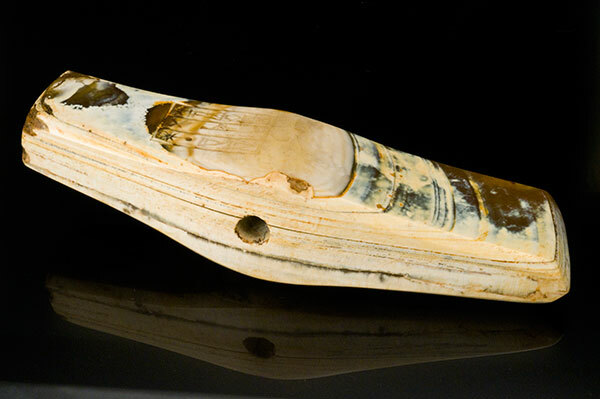 It is an ancient Babylonian axe-head made of banded agate. So regular, indeed, is the disposition of the layers in this agate that one might be justified in denominating it an onyx. Its prevailing hue is what may be called a “deer-brown”; some white splotches now apparent are evidently due to the action of fire or that of some alkali. This axe-head bears an inscription in archaic cuneiform characters, and presumably in the so-called Sumerian tongue, that believed to have been spoken by the founders of the Babylonian civilization. The form of the inscription indicates that the object dates from an earlier period than 2000 B.C. While the characters are clearly cut and can be easily deciphered, the inscription is nevertheless exceedingly difficult to translate. It is evident that the axe-head was a votive offering to a divinity, probably on the part of a certain governor named Adduggish; but whether the divinity in question was Shamash (the sun-god), or the god Adad, or some other member of the Babylonian pantheon, cannot be determined with any finality. The French assyriologist, François Lenormant, who first described this axe-head in 1879, and Prof. Ira Maurice Price, of the Semitic Department of Chicago University, both admit that it may have been consecrated to Adad. As the weather-god, the thunderer, the axe-symbol would have been more especially appropriate to him in view of the usage, almost universal among primitive peoples, of associating stone axe-heads or axe-shaped stones with the thunderbolt, and hence with the divinity who was believed to have launched it toward the earth. *For a fuller description of this valuable relic, and a discussion of the meaning of the inscription, see “On the ancient inscribed Sumerian (Babylonian) axe-head for the Morgan Collection in the American Museum of Natural History,” by George Frederick Kunz, with translation by Prof. Ira Maurice Price and discussion by Dr. William Hayes Ward. Bulletin of the Museum, vol. xxi, pp. 37–47, April 6, 1905. Extracted from the Bulletin of the American Museum of Natural History, Vol. XXI, pp. 37–47, April 6, 1905. From the collection of Bill Larson. This remarkable stone object (a Babylonian ceremonial axe-head) was secured for this collection in 1902 in England. It is one of the oldest known stone objects of a weapon form with an inscription, although copper and metal objects were frequently so marked. It is historic and almost unique. This axe was obtained by the Cardinal Stefano Borgia while at the head of the Propaganda [Sacred Congregation for the Propagation of the Faith, or Sacra Congregatio de Propaganda Fide], but whence or how is not known. (See note at the end.) The Contessa Ettore Borgia, his niece, offered it to the British Museum some ten or twelve years ago, but at so extravagant a value (about three or four thousand pounds sterling) that it was returned to her. It was ultimately acquired for some 15,000 lire by the late Comte Michel Tyszkiewicz,  and soon after his death there was a dispersal of his collection of engraved stones, bronzes, marbles, and other antiquities. After the sale, the axe was purchased for Messrs. Tiffany and Co. by the author, and, through the generosity of James Pierpont Morgan, Esq., was presented to the American Museum of Natural History, New York City, on April 16, 1902. The object measures in length 134.5 mm., width 35.5 mm., thickness 31 mm., and weighs 226.8 grammes. It is made of banded agate, the layers being very parallel, so much so that it might well be called an onyx. The color is a snuff-brown, really a deer-brown. It is in part spotted and splashed with white, evidently due to contact either with fire, or fire and some alkali, such as soda. This patina covers the larger part of the inscription, and has been produced since the latter was cut. The incising was the result of bow-drill work. The hardness is 7. On the reverse is a letter W, very rudely picked in with a steel tool. But this is evidently of [a more] recent date. This axe-head was first described by Francesco Lenormant, in ‘Tre Monumenti Caldei ed Assiri di Collezioni Romane’ (Rome, 1879, pp. 19, with plate vi, fig. i, pages 7–9). Fig. 1. Inscription, 1 in. x 5/8 in. 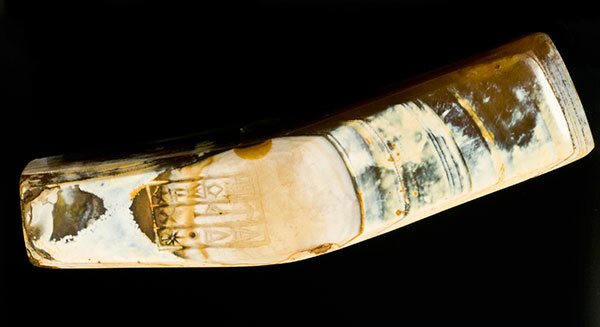 “The little inscription that forms the subject of this note is an intaglio on the side of an axe-head made of banded agate, as seen in the accompanying illustration (Fig. 1). It occupies the space of one inch in length by five-eighths of an inch in width. It consists of three lines written in archaic Babylonian characters, of which the accompanying cut is a facsimile reproduction. 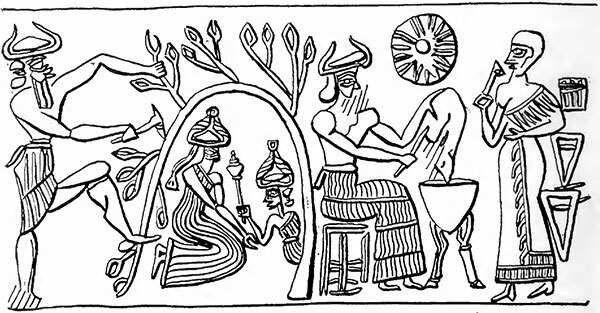 “The character of the signs is that current in Babylonia from the earliest times down to 2000 B.C, both on cylinder seals and in larger inscriptions. The language is the primitive form of the cuneiform languages called “Sumerian” by one school, and by another “Akkadian.” Its out-standing feature is that it is written largely in ideographs, signs that designate ideas, rather than syllables. This was the favorite method of marking important documents, or dedicating them to some particular divinity or divinities. “The accompanying cut (Fig. 2) is a transliteration of the inscription into the later Assyrian character, the form of writing current in Assyria from 1500 to 606 B.C. (dedicated) to the god Shamash, his benefactor. “Another possible rendering is to take the first sign in the first line as naming a particular stone, the determinative sign usually found before such words in prose being omitted. This omission, especially before signs whose character can be otherwise determined, is frequent in the so-called Sumerian inscriptions. The syllabaries (Brünnow, No. 11822) designate a fish-stone ( =aban nûni), which has been thought by some scholars to be os sepiæ, ( =‘cuttle-fish bone’). May it not be that this first sign in the first line designates a stone, which, because of its banded character, is likened to a fish? Hence it could be read ‘the precious stone of Ad-dug-ish,’ etc. “It seems evident from the usual custom in the use of such inscriptions that the first sign should designate something relative to the object on which it is found. Hence the designation ‘stone,’ or (‘precious) stone,’ indicated in the suggestion made above, may be the true meaning for this bit of an inscription. The last line contains first the designation of a divinity, probably either Shamash, or Adad, the archaic small circle being used for the usual sign U in later Assyrian. Shamash seems to be appropriate, for he was the sun-god, whose warm light fed the life of man, beast, and vegetable, and made the earth bring forth in abundance to feed man and beast. 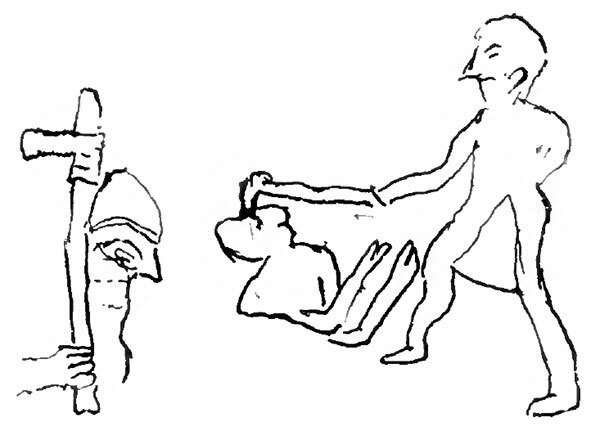 The signs translated ‘his benefactor’ might be more fully rendered by a paraphrase, ‘the one who supplies him with abundance.’ On the other hand, Adad was the weather-god, the thunderer, who poured out the floods, and who appeared as a warrior with a weapon in one hand and a thunderbolt in the other. On seals he often leads a bull by a leash. If the god in the last line of this inscription should be read ‘Adad,’ then there may be some reason in translating the first sign as ‘defense,’ ‘weapon,’ making the axe-head supply a symbol of the principal attribute—the war-like one—assigned to the god Adad. The last two signs may then be read as ‘his lord,’ ‘his conquering one,’ etc. (dedicated) to the god Adad, his lord. “In the archaic ‘Stele of Vultures’ of about 4000 B.C., or earlier, is a figure of a king seated in his chariot, carrying a quiver with arrows, and what may be a peculiar bow, but looks more like a boomerang. Following him are his soldiers armed with spears and battle-axes shaped (Fig. 5): (See De Sarzec, ‘Découvertes en Chaldée,’ pl. 3 bis. See also pl. 5 bis, 3 b, for similar axes). But that the double axe was known is shown by a terracotta votive axe, ib., pl. 45, 5. “In the bas-relief of Naram-Sin, King of Agade, in Babylonia, generally supposed to have reigned about 3750 B.C., the king is armed and followed by his soldiers, who are armed, in part, with axes. For the shape of the axes see De Morgan, ‘Délégation en Perse,’ I, p. 150. “Babylonian axes are not to be found, I think, in the art after perhaps 3000 B.C., until we come down to the axes of the northern region, which came in with the two-edged bipennis axe carried by Adad, or the chief god of the Hittite region. There it was a frequent object, and is found in Cretan art. Lenormant is uncertain as to the translation of the first two lines of the inscription; the third he renders ‘To his god,’ probably Ramman, the Rimmon of the Bible (2 Kings v, 18), the god of thunder, lightning, and all atmospheric phenomena. He figures the inscription, on page 7, enlarged, and transliterated into the later cuneiform, as in Prof. Price’s second figure; but regards the language as a very archaic Sumerian or Accadian form, of agglutinated character and almost impossible to render with any certainty, in the absence of some bilingual inscriptions as a guide. He points out that the object was strictly votive, or religious, in its nature,—a symbol and not a weapon,—and was connected with the widespread early veneration for celts and stone hammers, as supposed to have fallen from the gods; whence for votive purposes a stone object was made in preference to a metal one. Fig. 12. Chaldean Hammer bearing an inscription. The literature teems with curious and interesting accounts of the varied and widespread superstitions relating to prehistoric stone implements of all kinds, throughout Europe and Asia. Celts and stone hammers were believed almost everywhere to have fallen from the sky in connection with thunderstorms; and arrow-heads were called ‘fairy darts’ and ‘elf darts’; and all were supposed to have potent influences as charms. E. F. Stevens relates many singular superstitions about elf-darts in Ireland, Scotland, and Scandinavia, and even as far as Japan, where flint and obsidian arrow-heads are thought to be used by spirits. These were believed to fly through the air in storms, and to drop their weapons on the earth; and the people go out afterwards and look for them on the ground. In Ireland and Scotland they were worn upon the person as charms; and they are sometimes found in ancient Greek or Etruscan jewelry, as pendants. The belief that stone axes were connected with thunder was widespread; they were known among the Greeks as astropelekia, i. e., star-hatchets, and keraunia, thunder-stones. In Europe in the Middle Ages, they were supposed to be always discoverable at the roots of a tree that had been struck by lightning, or beneath a house so struck, and were credited with all manner of virtues,—to protect a house from lightning, to cure diseases in men and animals, to give strength and victory in contests, etc. Such an axe was hung round the neck of the ram or goat that led a flock, to preserve the whole of them from accident or the ‘evil eye.’ The Scandinavian folk-lore and Sagas tell of ‘victory-stones’ [or] ‘Thor-stones,’ worn by chieftains, which rendered them secure and successful in combat. Two such narratives may be cited, from the Bern’s Saga, one of King Nidung, and the other of Sigurd, who were made victorious by ^ such stones, which were undoubtedly amulets of this kind. (‘Flint Chips,’ pp. 873–890.) Galba, when general, found twelve celts in a small lake which he drained when that was struck by lightning, and believed he was to be a great man. The modern archaeologist knows that it meant that Galba had found the site of an ancient Lake Dwelling. Fig. 13. 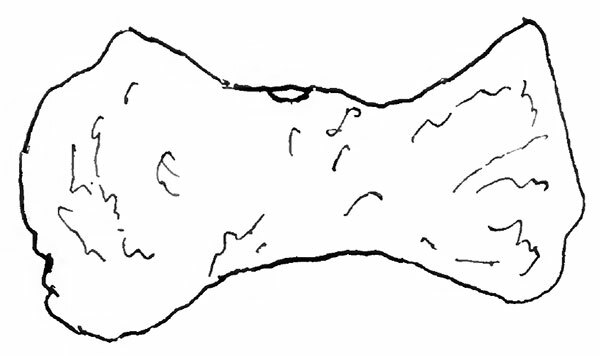 Votive Axe of Thotmes III. “A few examples, it is true, are of fairly artistic shape, and bear engraved inscriptions: one of these, a flint hammer of beautiful form, belonged to a god, probably Ramman, and seems to have come from a temple in which one of its owners had deposited it. It is an exception, and a remarkable exception. Stone was the material of the implements of the poor—implements which were coarse in shape and cost little; if much care were given to their execution, they would come to be so costly that no one would buy them, or, if sold for a moderate sum, the seller would obtain no profit from the transaction. Beyond a certain price, it was more advantageous to purchase metal implements. “It was found in the ancient collection of Cardinal Borgia, and belonged some years ago to Count Ettore Borgia. An engraving of it was given in Stevens, ‘Flint Chips,’ p. 115, and a facsimile of it by Fr. Lenormant, ‘Tre Monumenti Caldei,’ etc., 1879, pp. 4–9, and pl. vi., 1; Cartailhac, ‘L’Age de la Pierre en Asie,’ in the Troisième Congrés provincial des Orientalistes, tenu à Lyon, Vol. I., pp. 321, 322, has reproduced Lenormant‘s notes on it. “Finally, the crook and the wooden-handled mace, with its head of white stone, the favorite weapon of princes, continued to the last the most revered insignia of royalty. “The blade is of bronze, and is attached to the wooden handle by interlacing thongs of leather (Ghizeh Museum). Drawn by Faucher-Gudin, from a photograph by Emil Brugsch-Bey. “The crook is the sceptre of a prince, a Pharaoh, or a god: the white mace has still the value apparently of a weapon in the hands of the king who brandishes it over a group of prisoners, or over an ox which he is sacrificing to a divinity (Lepsius, Denkm., II., 2 a, c, 39 f, 116, etc.). Most museums possess specimens of the stone heads of one of these maces, but the mode of using it was not known. I had several placed in the Boulak Museum (Extrait de l’inventaire, p. 10, Nos. 26586, 26587, in the ‘Bulletin de l’lnstitut Égyptien,’ 2d series, Vol. VI). It already possessed a model of one entirely of wood (Mariette, ‘La Galerie de l’Égypte ancienne,’ p. 104; Maspero, ‘Guide,’ p. 303, No. 4722)." It is certainly a matter for congratulation that this remarkable and almost unique specimen should have been secured for this Museum. 1. Read before the New York Academy of Sciences, Jan. 29, and Feb. 27, 1905. 2. Collection d’Antiquités du Comte Michel Tyszkiewicz, decente par W. Froehner. Paris, 1898. Folio, p. 97, plate xxxii. 3. Lenormant, F., in ‘Tre Monumenti Caldei ed Assiri,’ Roma, 1879, pl. xiv, gives a transliteration into Assyrian of this inscription, but he misread the first two signs in the first line, and the first two in the third line. He finds the god Ramman, however, and gives an appropriate description of him. 4. Thanks are due to the Rev William Hood Stewart of the Roman Catholic Church of the Epiphany, New York City, for much of the information in regard to Cardinal Stephano [sic] Borgia. By Prof. J. Dyneley Prince and Dr. Robert Lau. Extracted from the Bulletin of the American Museum of Natural History, Vol. XXI, pp. 49–52, April 6, 1905. 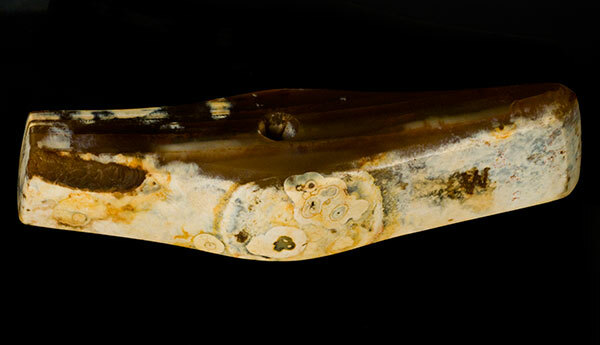 In the Tiffany Collection of gems belonging to the American Museum of Natural History is a remarkably perfect and very ancient Babylonian axe-head of pure agate. This object was originally obtained by Cardinal Borgia while at the head of the Propaganda and was subsequently offered by the Countess Ettore Borgia to the British Museum for sale, whence it was returned to her, owing to the Museum's lack of funds to purchase it at that time. It was then acquired by Count Michel Tyszkiewicz for the sum of 15,000 lire (Italian), who kept it until his death, when it was purchased by Mr. George Kunz, of Tiffany & Co., of New York, by whom it was added to the Tiffany Collection, which was later presented to the American Museum of Natural History by Mr. J. Pierpont Morgan. The axe-head is interesting, not only because of its extreme beauty as an artistic production, which undoubtedly entitles it to its very prominent position in this unique collection of gems and rare coins, but also because of the inscription in archaic Babylonian characters, with which its obverse side is embellished. A discussion as to the probable age of this object must depend, first, on the nature of this inscription, and, secondly, on the character of the agate of which the hammer is made. The dimensions of the Morgan axe-head are as follows: Length, 13.7 cm. ; width over the handle-perforation, 3 cm. ; length of the back, 1.7 cm. ; width of the back, 1.9 cm. ; diameter of the perforation, 0.9 cm. 1. . . . . -ni-šu ‘his . . . . .
3. . . . . nu . . .
4. . . . . .-šu his . . . . .
For the Babylonian text alone, see Hilprecht, ‘The Babylonian Expedition of the University of Pennsylvania,’ I, part ii, plate 61, nr. 136. The king Nazimaruttash (ca. 1340 B.C. ), the son of Kurigalzu II (ca. 1350 B.C. ), was evidently the donor of this Nippur axe-head to the temple of some god whose name is mutilated. The inscription shows how the gift of the object was thought to induce the god to look favorably on the donor, whose gift should be an incentive to the god “for hearing his prayers and prolonging his days.” The Nippur axe was found at Nippur in a chamber on the edge of the canal outside of the great southeast wall. It is evident, therefore, that, although this Nippur axe-head is far inferior, from the point of view of pure art, to the Morgan axe-head, the former object is more valuable from an archaeological point of view, as we have the exact data regarding it and are able to determine its age with absolute accuracy. It is clear, however, that we must expect an inscription of similar import on the Morgan axe-head, which was plainly an object intended to serve the same votive purpose as that of the Nippur axe. That the first line shows a proper name is evident, although we miss here the customary upright determinative, usually preceding proper names. This omission, however, is not without parallel (cf. op. cit. plate 51, nr. 121, line 4, the king’s name Ur-(ilu)Bati; op. cit. plate 36, nr. 86, line 2, the king’s name Lugalkigubnidúdú, etc.). There is no exact parallel to the name Khattish, which is probably not a royal name, but that of a high official at some Babylonian city, court, or perhaps that of a local governor, as the axe-head seems to antedate the unification of Babylonia under the hegemony of the city of Babylon by Hammurabi (2342–2288 B.C.). It should be noted, however, that the name Xa-aš-xa-mi-ir occurs I. Rawl. l. i. nr. 10, as that of a ruler (patesi) of the city of Iš(?)-ku-un-Sin. This name, Xašxamîr, seems to be a name of the same general character as Xa-aṭ-ṭi-iš (see for Xašxamîr, Radau, ‘Early Babylonian History,’ p. 30, note). The two signs which are translated ašârid, ‘chief person,’ occur in this sense, V. Rawl. 44, 36c, referring to the god Ninib as the ašâridu, the usual ideogram for which, however, is SAG-KAL and not our combination PAP-ŠEŠ, which is very rare. The last line presents no difficulty, as the three signs, AN-NI-NI, can only be the ideogram for ilâni, ‘gods.’ It is clear that the verb iqîš, ‘he presented (it),’ must be understood as the grammatical complement to the inscription, which is complete and shows no traces of mutilation. The characters of this inscription are very antique, approaching more closely in form those of the Gudea period (ca. 3000 B.C.) than those of later date. On the other hand, the dated inscriptions from the time of Gudea show a slightly more linear and less cuneiform character than do the signs on the Morgan axe, where the wedge is beginning to appear, which leads us to the opinion that this inscription may date between Gudea’s time and that of Hammurabi (2342–2288 B.C. ), when the wedge was even more prominent than we see it in the inscription on the axe-head. The objection may always be raised that we have here a piece of much later work, with the inscription deliberately written in archaic characters after the style of some of the documents of Nebuchadnezzar II (604–562 B.C. ), who caused inscriptions to be written in imitation of the earlier Babylonian writing. This does not seem probable to us, owing to the general character of the signs in question, which are too naturally cut to admit of this supposition. Deliberate archaization would, we think, have produced a somewhat more clearly cut inscription and also one in which the linear tendency was not so well marked as we have it here. The accompanying photograph illustrates the linear character of these signs better than the written reproduction. The stone is distinctly agate in layers, not agate with circular or ring-like marking, which would militate against a very ancient date for the object. The appearance of the layers, however, does not preclude the date which we suppose for the Morgan axe, i. e., between 3000 and 2300 B.C., probably nearer 3000 B.C. than the later date. 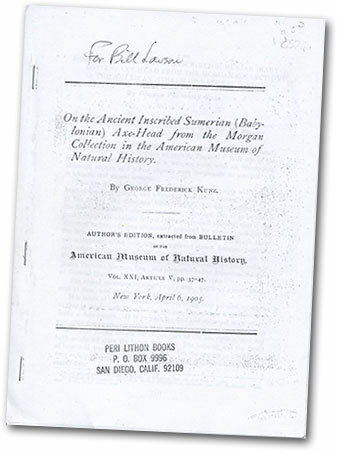 Reprinted from The American Museum Journal, Vol. XIII, No. 4, pp. 159–168, 171, April 1913. 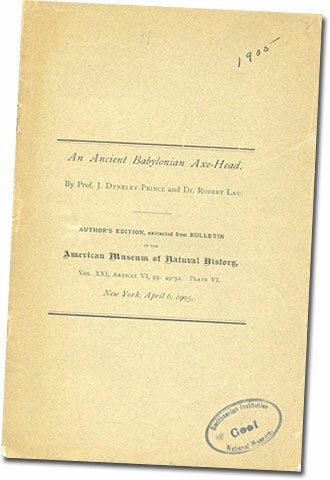 Regarding the cover of the April 1913 edition of The American Museum Journal, which also was used for the reprint, was described on the original edition’s page 200. The cover of this number of the Journal is designed from objects of antiquity and historic value in the Morgan gem collection. Babylonian cylinders dating from 4000 to 400 B. C. are combined in the border, an enlargement of a portion of a fifteenth century turquoise inscribed with two thousand words of the Koran forms the inner band, and an agate axhammer of ancient workmanship occupies the lower left-hand corner. The cylinders are engraved with figures and names on various minerals such as lapis-lazuli, jasper, chalcedony, steatite, hematite and agate. The axhammer of banded agate was in the possession of Cardinal Borgia while at the head of the Propaganda, was acquired from the Countess Ettore Borgia by Count Michael Tyszkiewicz for 15,000 francs ($3000) and purchased by Tiffany and Company soon after his death. It found its way into the Museum’s gem collection through the generosity of Mr. Morgan. The axe head is mentioned near the end of this opening excerpt from the text of Kunz’s article, in boldface to facilitate location. Of all the many and munificent gifts with which our great and lamented fellow citizen, John Pierpont Morgan, enriched the collections of our museums, none has afforded more instruction to a large number of visitors or is more highly appreciated and better known than the wonderful Morgan gem collection exhibited on the upper floor of the southern wing of the American Museum of Natural History, on the Seventy-seventh Street side. We can truly say also that none of Mr. Morgan’s gifts gave him more pleasure, and his interest in the collection was as keen the last time I spoke to him as it had been at the outset. That one so familiar with the best in all branches of art should be a lover of beauty of form and color goes without saying, and we may add that his thorough appreciation and understanding of the finest examples made him a severe critic in such matters, rendering him intolerant of everything mediocre, commonplace or uninteresting. And he possessed withal a wonderfully retentive memory of what he knew was in the collection or of what he had seen, which only enhanced his admiration of what was exceptionally fine. Until 1882 scarcely any attention was paid to precious stones in the United States. A few years before that date I had seriously taken up the subject of studying and collecting gems, and had prevailed upon Messrs. Tiffany and Company to preserve the best examples that presented themselves to form the collection which was exhibited in a circular pavilion at the Paris Exposition of 1889, in the center of the American section. 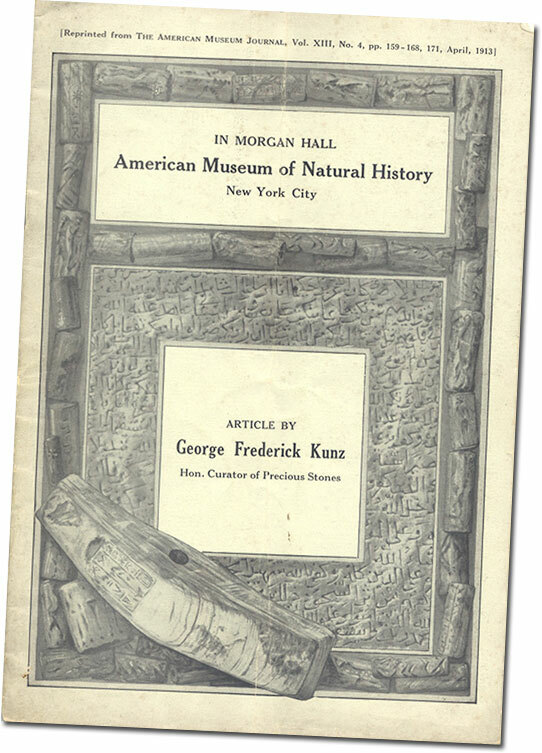 At the solicitation of the late Morris K. Jesup, president of the American Museum of Natural History, Mr. Morgan presented this entire collection to the Museum. The specimens were displayed in two long cases on the upper floor, and some five years later the fact that the tile pavement on both sides had been worn to a considerable depth along the line where the cases stood, gave testimony to the interest excited in the general public. The success of the first collection led me to believe that a collection of precious stones of other than American origin would be worthy of a greater national exhibition, and a consultation was held with Mr. Morgan. As a result a new collection was made and proved to be larger than had originally been anticipated. It was purchased on condition that it should be shown at the Paris Exposition of 1900 where it received a Grand Prize and occupied a most important position in the Department of Mines. This latter collection was the result of a trip throughout Europe, Asiatic Russia, the United States and Mexico. The finest examples were obtained by purchase frequently, sometimes however only through exchange with collectors or museums. This collection is now installed in the American Museum of Natural History, a crowning glory to the many magnificent assemblages of other things in the Museum. The collection is especially remarkable for the many unique things it contains, among which are the most perfect large sapphire known, a Babylonian ax-head of banded agate, four thousand years old, and a wonderful series of sapphires, blue, pink, salmon and brown. There is also a magnificent series of beryls; a large series of tourmalines; an immense section of jade—an entire boulder but so thin that it measures not more than one eighth of an inch through. The great hyacinth with the portrait of Christ engraved on it, the gift of a Vatican cardinal to a friend, is in this collection. The two collections as eventually completed consist of 2176 specimens of gem-stones, objects of precious-stone, and 2442 pearls. Taken in its entirety the present collection is the most extensive and carefully selected display of rough and cut stones in existence. The specimens of ancient Babylonian minerals represented by engraved cylinders constitute in themselves a quite unique possession, and the same may be said of the collection of opals and of the collection of kunzite specimens. Magnificent cut specimens of morganite must also be noted, as well as a mass of quite transparent aquamarine, the heart of the great crystal found at Marambaya, Brazil, a piece weighing fourteen pounds. This mass of aquamarine is the largest piece of gem beryl known. There are also magnificent crystals of rubellite found during the past year at Pala, San Diego County, California. This book originally was published in 1938 by Whittlesey House, an imprint of McGraw-Hill. The passage discussed below is from pages 13–14. 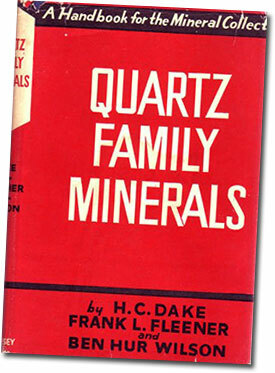 In their chapter, The Historical Lore of Quartz, authors Dake, Fleener, and Wilson begin with a section titled Primitive Tools, Weapons, and Ornaments, which states that according to archaeological evidence, the Sumerians were the first to employ semiprecious stones for ornamental purposes and to master lapidary art. Objects that were fashioned from these stones included beads and other jewels, signet rings and cylinder seals. Beads were crafted in a cylindrical shape, from carnelian and agate, the source of agate likely being India. In the next section, Agate Valued by the Ancients, leads off with a discussion of ceremonial axheads, “the purpose of which is conjectural.” The first such axhead described is the one now in the collection of Bill Larson. The description is very brief, with no information that is not already included in the other sources, reprinted above. The axhead is pictured on page 14, with the inscription on the right, i.e., upside down.